Yesterday before leaving on a 7-week sailing vacation from Stavanger to Lofoten, I installed two Nasa BM-1 Battery Monitors, one for each battery. Knowing the charge level and drainage on the batteries is quite fascinating. I taped the full-size displays, at the port-side bookshelf, with 3M heavy duty double-sided foam tape. However, my battery indicator shows a charge when everything is turned off. This suggests that the engine battery is balancing with the domestic battery. Not a good thing if the engine battery goes flat as a result!! Also does anyone know how to stop it. I assume some sort of diode is needed but what sort & where would it go? I have also noticed that negative link cable between the battery monitor & the shunt is smaller than the main negative wires . Does this matter? or will it overheat ? My wife and I own a 2007 model 315 so these comments reflect that model, however I do believe there are no substantial differences in the electrical system of the these boats. My boat from new had two 85 A/hr lead acid batteries under the port bench. They are not designated engine or house but can be used in either capacity. There is a mains charger that has a dual output, effectively charging each battery when the 1 or 2 or both switch is not in the “both” position. So make sure the 1 or 2 or both switch is not in the "both" position. My advice to all users with this configuration is not to use the "both" position unless you are charging from the engine. There are no diodes or relays in the standard configuration. After a battery failure last year I fitted a dedicated engine start battery under the stern cabin bed adjacent to the fuel tank. This was connected electrically via a charge relay and is simple to fit, if anyone is interested I can post electrical drawings and some photos. The battery I used is an aircraft quality AGM that can operate in any orientation; these batteries do not gas externally. This battery has its one dedicated float charger when connected to the mains electricity supply. The charge relay only operates when the engine start battery is fully charged, and then diverts the alternator charge to both house batteries when the 1 or 2 or “both” switch is in the both position. I leave the switch in the both position permanently except when connected to the mains. In terms of the shunt cables, the shunt is a coil wrapped around the main cable and measures the current going in either direction. The current the meter reads is effectively tiny in comparison to the current in the main cable, think of it as a transformer. So small cables are fine. The shunt it’s self should have the multiplier written on it somewhere normally shown as 1000:1 or something similar. So if the main cable is drawing 1000 amps the shunt cable will draw 1 amp. Hope this helps, any questions please get back to me. Good idea re the start battery. Is it very heavy & what is the amp hour. Presumably it does not need to be very big just to start the engine. A This could be caused by the second battery charging the first; however, from the description of your circuit that seems unlikely. It could be the unit needs calibration or the shunt is connected back to front! Can you confirm that the unit shows a discharge when a load is connected? 3. The small cable (6mm) is between the shunt & battery. Out the other side of the shunt goes the end of the wire that was once connected to the battery (10mm). So now the shunt is in the line but on one side is a smaller wire than on the other. If it needed a 10mm wire originally is there any disadvantage putting a 6mm one in the circuit. A For domestic use this is fine, you only need to go to larger cable for heavy use of equipment for example, engine start or bow thrusters. 4. Good idea re the start battery. Is it very heavy & what is the amp hour. Presumably it does not need to be big just to start the engine. We are based in the SE of England, if you are nearby I will be happy to look at it for you. I guess the installation of a Nasa BM1 battery monitor won't disturb the led status battery voltage reading on the Hanse electrical panel,... is that right? You are right, it does not disturb the digital or LED display at the Panel. However the batt Monitor gives you a voltage with a significant better precision. My Display at the Würth Panel showed always 14.8 V during charging which was in reality 14.2. - 14.4 V in line with the AGM Victron recommendations. 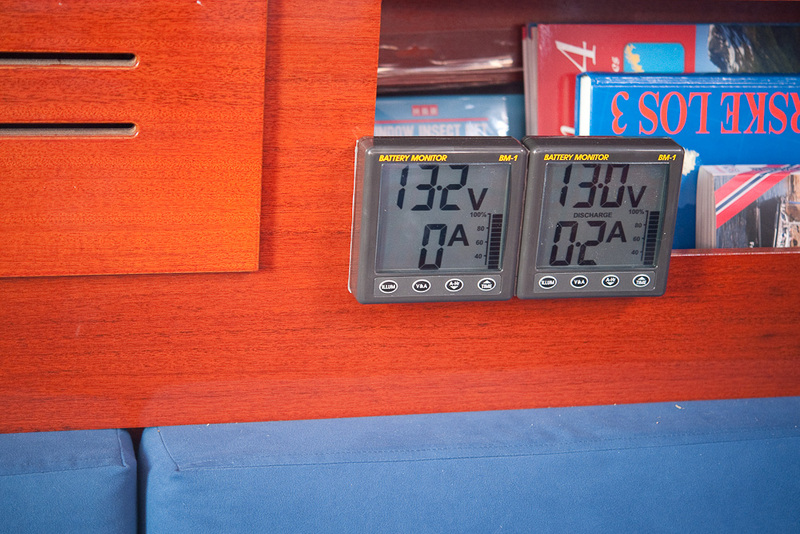 I have the Philippi BCM monitor which give me service batt charge and cycle info, as well as voltage for starter and bow thruster battery. I am hoping someone can help me to get my Service Batteries to readout on my DC panel? I apologize as this is my first post, not sure if doing it right? ?